“KUSAM-MECO” underground Cable Fault Pre-locator ModelKM-CFL-620 is an automatic Cable Fault Locator which adopts ARM,FPGA & Dot Matrix Color LCD display Technology. This tester combines both pulse reflecting technology (TDR) & intelligent Bridgetesting (Bridge) for measuring the exact fault location such as brokenline, cross faults, earthing, poor insulation & poor contact of the lead covered cables as well as plastic cables. It is capable of giving IRtests in Bridge mode.It is a microprocessor based fault locator with a user friendly menu. It is easy to operate. It tests almost all power cables, telecom & signal cables. It has an English menu which is easy to understand & use. 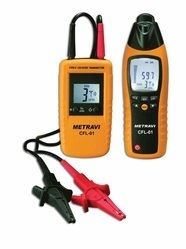 With Megameter & Ohmmeter it enables to test insulation resistance & loop resistance. It has USB Port for uploading test data to computer. Small size, light weight and ABS plastic housing which is ergronomically designed for easy use by user. Range, VOP and Gain are selected automatically. Color LCD Display (480 x 280 dots). Both pulse reflection (TDR) and intelligent bridge (Bridge) testing for open, short, or low insulation cable faults. Manual testing function is also available. With 4 GB USB Pen drive, it is easy to upload memory data to computer. Power Supply : 7.4V Rechargeable Li-ion battery. Charging voltage 230V +/-10%, 50Hz, single phase. Storage Temperature : -15°C ~ + 55°C; RH <85%RH. Working Temperature : -15°C ~ + 55°C; RH <85%RH. Used to detect or trace conductors and to find short faults in them. The signal generated by the transmitter is made to a modulated current, generating an electromagnetic field around a conductor. This electro magnetic field induces a voltage within the receiving coil. The induced voltage is amplified, decoded and converted to the original signal by the received and finally displayed on screen. Fault Distance : 50m, 100m, 0.3 Km, 1Km,Range 3Km, 5Km & above. Fault Measurement Accuracy : ±1%. Pulse Width : 35ns, 50ns, 80ns, 250ns,Ranges (ns ±10%) 800ns & 1800ns (approx.). Pulse voltage : 22V p-p ±10%. Output Impedance : 150 Ω. Cable Constant Input : V/2 in upto 150 meteres/μsec (digital). Fault Distance Read-out: 5 digit seven segment display. CRT Display : 8 x 10 div (1 div = 0.55 cm). Sensitivity : 50mV p-p produces one vertical division display. Power Supply Internal : 10 x 1.2V Rechargeble Ni-Mh Maintenance Free Batteries of at least 8 A-H capacity (Built in Charger 230V ±10%). Power Supply External : DC 12V - 15V, 1.0 Amp. Timer : Built-in timer Switches power off automatically after 10 minutes (approx.) of idle running to save battery energy. Operational : 0OC to 50OC RH 85%. Weight : 7 Kgs. (approx.). Dimensions (in mm) : 355 (D) x 275 (W) x 115 (H) approx. Instruction Manual - 1 No.Ext. DC Power Lead - 1 No. Test Lead 3 Pin - 2 Nos. Carrying Case - 1 No. APLAB Model 3039-I cable fault locator is portable,rugged, simple to operate and which can taste, locate& display on the CRT the short & open type of faults in long run of coaxial and twisted pair in telephone and other communication application. It measures the distance to the faults, directly giving a digital readout.It also gives an insight into the joints, cable change sand faults aiding location of the fault. Model 3039-I works on the principle of Time domain reflectometry (TDR) and locates cable faults upto an approximately distance of 5 Km & above with an accuracy of ±1%. The velocity of propagation (VOP)V/2 for each cable type is set on a three digit thumb wheel switch. It sends out an electrical narrow pulse of 35 to 1800ns width depending on distance to be covered with a fast rise time. The pulse is then reflected backto the unit from the cable impedence mismatch or the fault location. The distance of the fault is then computed automatically and indicated in meters or feets on a large LED display which will eliminate the manual calculations. Fault type is also identified by the graphic display of the shape of the reflected pulse. It is simple to operate and less error prone than manual bridge technique. It being light weight and portable can be carried on the field and can be operated for at least 8 hours on the internal rechargable batteries. Model 3039-I is provided with rechargeble batteries and an in built battery charger. 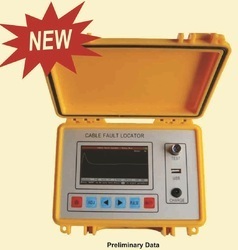 Looking for Digital Cable Fault Locator ?